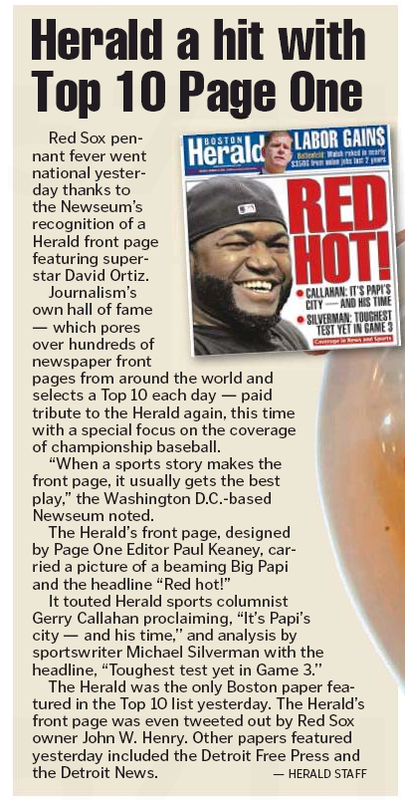 Today’s Boston Herald has a swell time patting itself on the back for yet another mention by “Journalism’s own hall of fame” – that would be The Newseum – in its daily Top Ten Front Pages feature. When a sports story makes the front page, it usually gets the best play. Just look at today’s St. Louis Post-Dispatch, which devoted half of Page One to the Cardinals’ baseball playoff loss. Of course, newspapers aren’t always so keen to promote defeat. The Indianapolis Star found a way to downplay the Colts’ loss in “Monday Night Football” by focusing on the positive. Go team! You don’t have to tell the feisty local tabloid twice. The Herald was the only Boston paper featured in the Top 10 list yesterday. The Herald’s front page was even tweeted out by Red Sox owner John W. Henry. You know he’s gonna own the Globe too, right? It doesn’t get much better than that for the Heraldniks. This entry was posted on Wednesday, October 16th, 2013 at 4:38 pm and is filed under Uncategorized. You can follow any responses to this entry through the RSS 2.0 feed. You can leave a response, or trackback from your own site.